Full disclosure: I ran out of vanilla extract so only used 1 tbsp. Used 225g berries per half and that seemed to work well. Two tiers definitely enough for most purposes. I was initially a little disappointed with this as the cake had an almost savoury flavour but seemed to improve the next day. Needed longer than stated at 150c. Very moist. Made for a work buffet and went down well with non vegans. Raspberries didn't hold up as well as blueberries and strawberries. Coconut cream was nice but didn't stiffen as much as I expected - milk brand? Updated to say was asked for the recipe! Made with 1 cup coffee and 1cup water. First attempt at this made as per gf variation was godawful - texture was great but had to throw away as tasted awful. Don't know if the problem was the flour or the xanthan gum. Repetition with self-raising gf flour and no extra xanthan gum was palatable but the best tasting option was non-gf with ordinary plain flour. 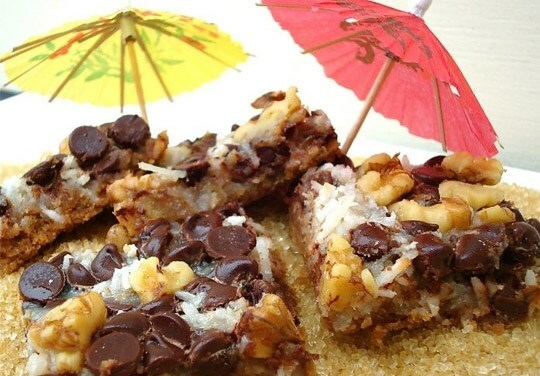 A decent but unexciting vegan option with potential as base cake for new variations. Clearly more experimentation needed to make both vegan and gluten free. Update - made 4-tier plain flour version for daughter's birthday with blackberry buttercream from "Twist". Got great reviews - "light" and "moist". A good chocolate standard. Size was huge - portions far too big for most - 3 tiers might have been more sensible but looked great. The layers did crack a little but the buttercream covered that up. Recipe takes 5-7 minutes longer than stated at 150c. I used flour labelled “wheat flour” from my favourite ethnic food store which may have been heavier than all purpose. I also cooked it a couple of minutes too long. Next time I’ll use all purpose flour and watch it carefully it’s worth trying again! Not too sweet. So, overall this is a great book. This reviewer tended to tune out that it was a “vegan book” as the various dishes were so enchanting, interesting and different. Chloe's fantastic-tasting, beautiful desserts are what first got her national media attention when she wowed the judges on Food Network's Cupcake Wars. Now Chef Chloe offers her first all-dessert cookbook. 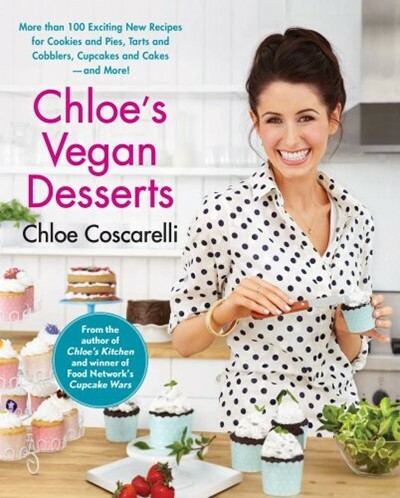 Chloe works a different kind of food science magic, with liquid proportions and leaveners like baking soda and vinegar to make cakes rise and remain moist and to give her food a texture and taste that vegans and non-vegans alike crave. Chloe re-creates classic desserts and treats from creme brulee to tiramisu to beignets as well as store-bought favourites-made with a humorous taste twist-like her ChloeO-type Oreos and Pumpkin Whoopie Pies. Chloe also serves up brand-new triumphs like her dreamy Lemon Olive Oil Cake with Rosemary Ice Cream, Coconut and Chocolate Cream Pies, Coconut Sorbet with Cashew Brittle, and a dozen innovative cupcake creations. Who can possibly resist?